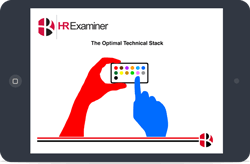 We have a trio of profiles this week from The 2019 HRExaminer Watchlist that cover job performance enhancement from Textio, the disappearing assessment interface from Traitify, and impressive legacy data utilization from Kronos. John Sumser speaks with Angela Lockman, the Vice President of Product Management for Tax and Compliance at Equifax Workforce Solutions, named one of the “300+ Women in HR Technology Worth Watching.” Listen to HRExaminer Radio. On HR Tech Weekly, Stacey and John host a packed show with news from Slack, Microsoft 365, WalkMe, PeopleFluent, NetDimensions, PlanSource, SmartRecruiters, and Noodles and Company. Textio was started with the simple notion that every time you wrote something, you knew exactly who was going to respond. Traitify has invented a new scientifically validated way to collect personality data using an image-based 90-second test. The process involves choosing between two different images in 72 pairs.